The emphatic, repetitive song of the Whip-poor-will is most often heard after dusk and before dawn during the late spring and early summer in Tennessee. This bird is seldom seen because it is active at night and its camouflaged plumage makes it extremely difficult to see when sitting on the forest floor during the day. Some individuals roost on tree limbs, but sit lengthwise and resemble a bump more than a bird. The Whip-poor-will breeds across much of eastern North America from central Canada eastward to the Atlantic coast and southward to Oklahoma and Georgia. It winters in the southeastern United States and into Central America. Description: The plumage is mottled grayish-brown and black overall, with the throat black bordered by a white band at the base. The head is large, and the bill is short and wide. In flight, the wings and tail are rounded. The male and female are similar in appearance, but the male has white tips to the tail, and the female's are buffy. Voice: This bird repeats its name, whip-poor-will, in loud, clear, emphatic whistles, accenting the first and last syllables. 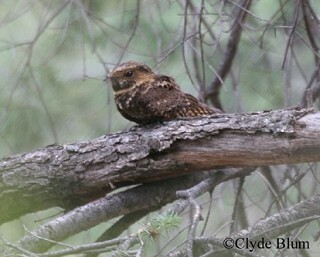 Chuck-will's-widow are larger with longer more pointed wings, and have a 4-syllable song. However, the songs of these two species can be confused. 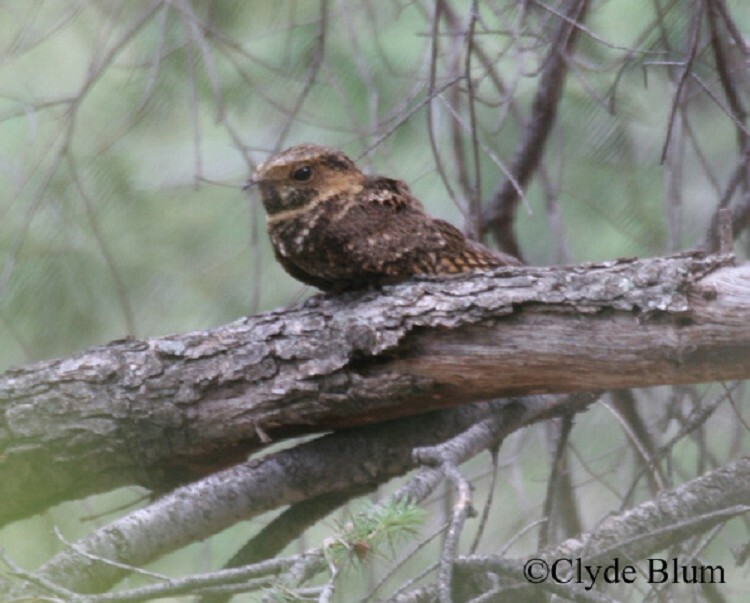 Common Nighthawk has a smaller head, longer, more pointed wings with bold white patches, and a notched tail. Habitat: Upland deciduous and mixed forest with forest openings. Diet: Mostly flying insects, especially moths and beetles. Nesting and reproduction: The same nest site is often used in successive years. Egg laying is synchronized with the lunar cycle so that young hatch during a waxing moon, and adults are able to more efficiently forage in bright moonlight. A second brood may be started while the young are still dependent on the adults. Clutch Size: Usually 2 eggs. Incubation: The female does most of the incubating, which last 19 to 20 days. Fledging: The young leave the nest shortly after hatching and are tended by both adults. They are able to fly when about 19 days old and can feed themselves when a month old. Nest: There is no nest structure; eggs are laid on dead leaves in wooded areas with an open understory. Status in Tennessee: Whip-poor-will is a fairly common summer resident in heavily forested areas across the state, frequently above 2,000 feet in East Tennessee. They arrive in late March and depart in early October. Numbers appear to be declining in the state, and rangewide. They are more often heard then seen. After hatching, the young spread out from the nest, sometimes forcibly shoved away from the nest site by a parent. This is done presumably to avoid predation. Whip-poor-wills time their egg laying so that the eggs hatch about 10 days before the full moon. This allows the adults to forage and feed the young throughout the entire night. Whip-poor-wills belong to the Goatsucker Family, found in the Old World as well as the New. This name is based on an ancient belief that these birds fed on goats' milk at night. Like other goatsuckers, the eyes of the Whip-poor-will reflect light directly back toward the source. They will often sit on gravel roads after dusk, so their orange to red eye-shine may be seen with the headlights of a car or a flashlight. Best places to see in Tennessee: Whip-poor-wills are found across Tennessee. They are most likely to be heard on moonlit nights between late March and July or seen at rest on a quiet dirt road after sunset or just before sunrise. Cink, C. L. 2002. Whip-poor-will (Caprimulgus vociferus). The Birds of North America, No. 620 (A. Poole and F. Gill, eds.). The Academy of Natural Sciences, Philadelphia, PA, and The American Ornithologists' Union, Washington, D.C.